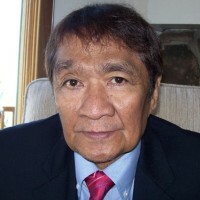 We have been informed by the eminent journalist and former Editor in Chief of Ring Magazine, Nigel Collins, that our longtime friend and colleague and a quintessential Filipino boxing man Hermie Rivera has passed away. In his email to us, Nigel said “I just read on Facebook that Hermie Rivera died. I knew he’s been sick, but the last time I traded emails with him he said he was fine and that the only thing that would kill him was the ‘hospital bill’. Just a thought. “Rascals” as Nigel referred to, are often lovable. And Hermie, was surely one of the most lovable rascals. The world of boxing has lost a genuine lover of the sport and a man who knew it inside out. We will all miss him deeply. Hermie's prized possession was former two division world champion Luisito "Lindol'" Espinosa whose career he nursed to heights of ring greatness and world junior welterweight champion Morris East. There were other talented fighters whose careers he molded including Philippine flyweight champion and world title challenger Socrates Batoto and Aniceto Vargas among others. Our condolences to Hermie’s family. God bless them all and may Hermie’s soul rest in peace. Editor's note: We at Philboxing would like to extend our deepest sympathies to the family and relatives of our dear colleague and contributor Hermie Rivera. He will be remembered as one of the most important personalities of Philippine boxing in the modern era.